Kids and fans alike can imagine the biggest battles and missions in the Star Wars saga with figures from Star Wars: The Black Series! 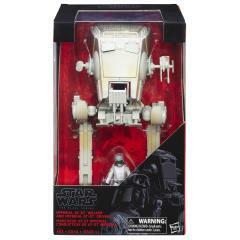 With exquisite features and decoration, this series embodies the quality and realism that Star Wars devotees love. 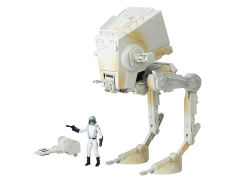 The two-man AT-ST is a lightly armored walker featuring chin-mounted laser cannons and side-mounted weapon pods. The two-legged transport, dubbed the Scout Walker by many, serves as a recon and patrol vehicle. This 3.75-inch-scale Imperial AT-ST Driver figure and AT-ST Walker vehicle from Star Wars The Black Series are carefully detailed to look like the Imperial driver and vehicle from the Star Wars films. These Star Wars Black Series AT-ST figures feature premium detail and multiple points of articulation, and vehicle features detailed, movie-accurate design.